Since the publication of the original edition, the importance of interpreting business data has become mission critical for professionals in all types of businesses. These professionals have discovered the benefits of business analysis to address their organizations most crucial strategic and tactical challenges. The Second Edition of this successful guide to business analysis, shows readers how to apply analytical tools without having to mire themselves in advanced math or arcane theory. Analysis Without Paralysis teaches readers the fundamentals of business analysis through the use of 12 core tools. Each tool will make the way readers assess and interpret their business' data more effective, accurate, and actionable. 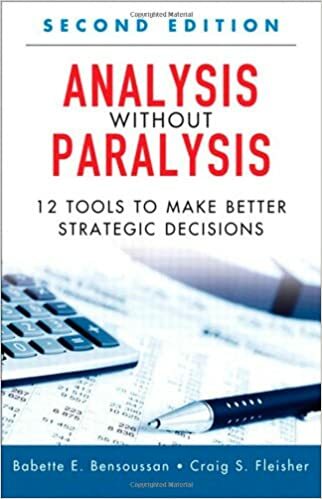 Accessibly written, the authors walk readers through the entire business analysis process and then explain ad illustrate each of today's most valuable analysis tools so business professionals will be able to make better decisions about their company's strategy and operations--and achieve better results. The Second Edition includes three new analytical tools and updates all of the prior edition's cases. For each tool, the authors present clear descriptions, context, rationales, strengths, weaknesses, step-by-step instructions, and case study examples.